The Global Assembly Cache is a machine-wide central repository for sharing .Net assemblies for the Microsoft .Net platform. It is useful as it allows different applications in the same computer to share the common assemblies. To deploy an assembly to the GAC, developers need to sign their assemblies using a cryptographic key pair. The key pair can be generated using the SN(?) tool found in Visual Studio installations. What is a Strong Name DLL? The signing of a DLL using a cryptographic key pair ensures the DLL is globally unique and cannot be spoofed by someone else. This DLL is often referred to as a Strong-Name DLL. Users of a Strong-Name DLL benefit from being able to map to the exact version of the DLL without any confusion(? Don't understand why users want to map to the exact version of the DLL without any confusion). ConnectCode .Net Barcode SDK provides a Strong-Name DLL signed using a cryptographic key pair. This allows the barcode DLL to be deployed to the Global Assembly Cache and you can enjoy all the benefits of a strong name DLL. 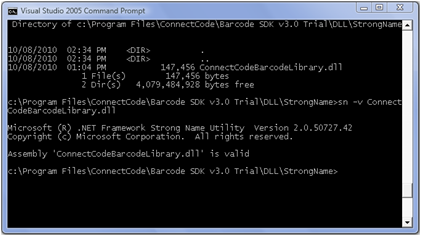 The Strong-Name DLL is stored in a subdirectory of the ConnectCode Barcode SDK. ConnectCode Strong-Name Barcode DLL can be installed into the Global Assembly Cache with the following command. It is important to ensure the Command Prompt used for executing the commands is started in Administrator Mode. gacutil -I "C:\Program Files\ConnectCode\Barcode SDK vX.0\DLL\StrongName\ConnectCodeBarcodeLibrary.dll"
The following command uninstalls the Strong-Name Barcode DLL from the GAC.